Virtual reality headsets at different price points are starting to hit the market, and today two more joined the fray... with one important catch. The HP Windows Mixed Reality Headset Developer Edition and Acer Windows Mixed Reality Headset Developer Edition are on sale on Microsoft's website, though as the names suggest, you must be a developer to buy one. At $329 (about £250 / AU$415) and $299 (£230 / AU$375), respectively, you might be tempted to nab one of these over, say, the more expensive Oculus Rift or HTC Vive (though the former is currently on sale for $399 / £399.99). Sadly, unless you're an app or game maker, you can't. But! There's hope yet. The headsets will eventually be sold to regular shoppers, and when they do there should be a decent amount of content to digest thanks to developers getting their hands on the headsets early. As of the time of writing, the HP Windows Mixed Reality Headset Developer Edition is sold out. 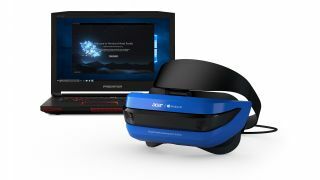 Both the HP and Acer Windows 10 VR headsets feature two 1440 x 1440 displays, 95 degrees horizontal field of view, 90 Hz refresh rate, built-in audio and mic support, a single HDMI 2.0 and USB 3.0 cable to hook up to a Windows 10 PC, and inside-out tracking. This last feature is basically a self-contained tracking system on the headset that allows you to have less powerful PC specs and doesn't require you buy external sensors to place around a room. Microsoft's aim is to bring Windows 10 mixed reality to the market with different partners, including HP, Acer, Lenovo and other companies that don't have a headset of their own. Whereas HoloLens, the company's $3,000 (£2,719 / AU$4,369) augmented reality visor, is intended for spaces like business, enterprise and education, these headsets are generally cheaper and more likely to appeal to the average consumer. Just when everyone can buy a Windows 10 VR headset is still unknown, but we bet it'll be a few more months before you'll get the chance.